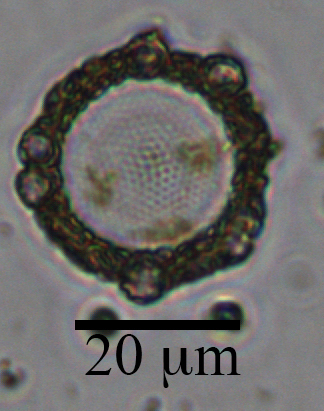 This centric diatom is surrounded by a halo of smaller coccolithophore cells. The circle in the center is the diatom. You can see the nano-patterns on the silica valve and some yellow/brown-ish chlorophyll inside the cell. Surrounding the cell are atleast 6 coccolithophores cells (smaller circles) and a ring of their coccoliths (the brown-ish looking mass). The silica frustules of diatoms and calcium carbonate coccoliths of coccolithophores are relatively heavy biominerals, and may increase carbon export out of the surface ocean by “ballasting” sinking particles. There is some debate in the literature about which biomineral is more important in exporting carbon. This diatom-coccolithophore association illustrates my opinion: they are probably both very important. This sample was collected in a sediment trap 4000 m deep, at the Station M time-series. I am currently counting phytoplankton within the particles collected over the past 30 years in these sediment traps in collaboration with Ken Smith and Crissy Huffard at MBARI, and thanks to support from a 2017 New Faculty Award from the California Sea Grant.